In 29 days, I am sailing away to the balmy Bahamas on a quilt cruise with Quilt Retreats at Sea. While we are at sea, we’ll be sewing like madwomen. 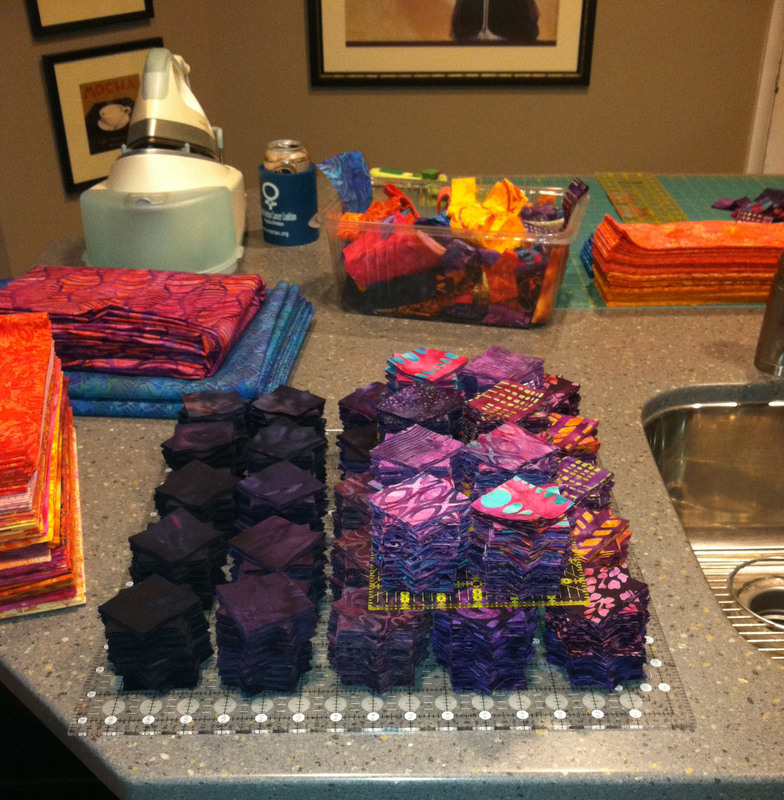 Between now and then, I need to cut 25 quilt kits plus some extras. 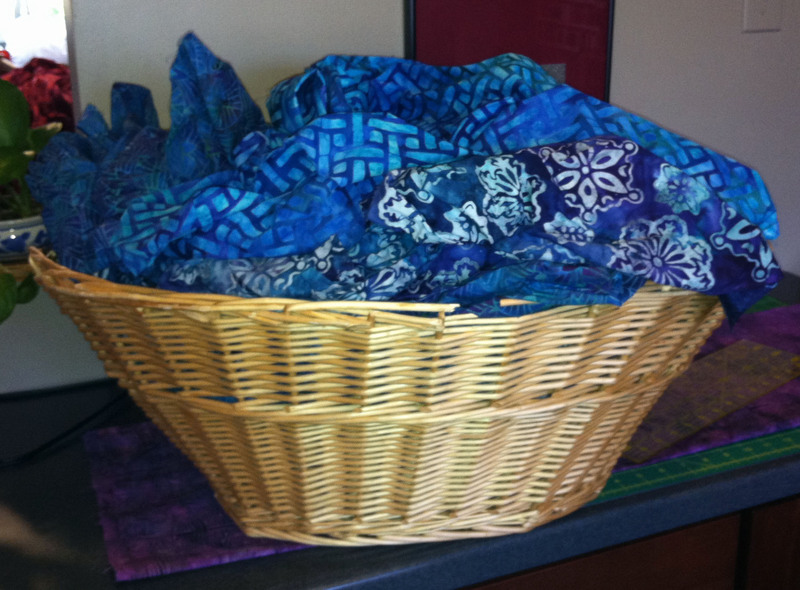 Wouldn’t it be great to sit down at a retreat and have all of the fabrics completely ready to sew? I prewash and press all of my fabric before cutting. As I’m preparing these kits and cutting yards and yards of fabric, I’m thinking about speed and accuracy. The secret to speedy fabric cutting is planning and common sense. If you need to cut strips, I think it’s easier if you first sort the fabric by yardage. Look at the entire task in front of you so that you can organize what you need to do. Group similar tasks together to save set up time. Make a list of what you need to cut, what fabrics to use, and how many pieces you need. Mark them off as you complete each task. The secret to accurate fabric cutting is having the right tools and using them correctly. Use the rotary cutter that works best for you. Try a few different models to see which one fits your hand best and which open-and-close mechanism is most convenient for you to use. I often switch off to a different model after I’ve been working for a while to give my hand a break. For cutting, find a nice large horizontal space that’s a good height. I like using the island in my kitchen. Rulers and mats vary in accuracy. Use good quality tools and check their markings for accuracy. My good friend Kathy Lincoln and I don’t often disagree, but we do on this point: I use the lines on the mat (yes, I’ve checked to confirm the markings are accurate) and Kathy uses only the lines on the ruler. Whatever you do, just confirm that your tools are accurate. I like to use the same tools for the entire cutting process to ensure consistency. I’ll change blades, but keep the mat and rulers. So, how am I approaching this monumental task? Well, I’m taking over the house! 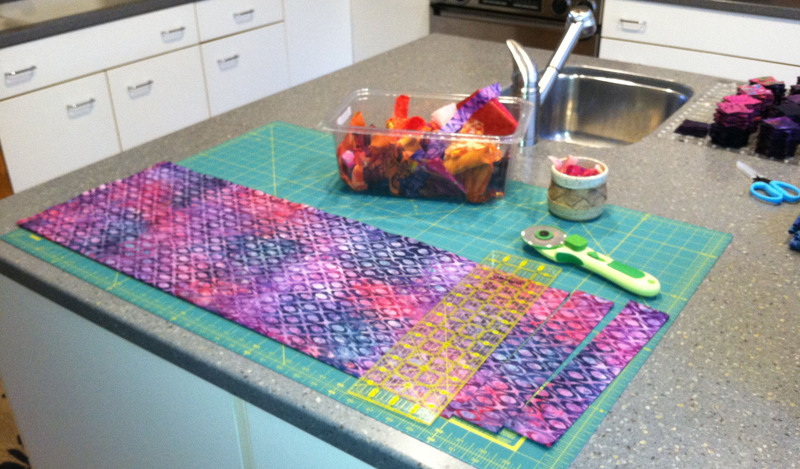 I use the kitchen island for pressing fabric and for cutting. 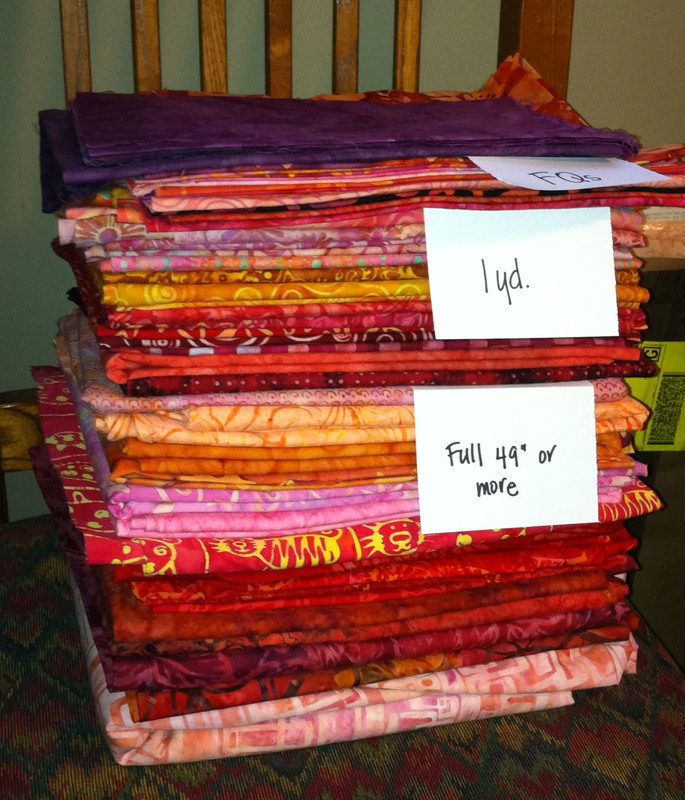 I use the table and chairs for organizing stacks of fabric, patterns, and notions. I use large square rulers to transport cut strips and squares from one place to another. Most importantly, I have fun. While I’m cutting, I may listen to a book from Audible or a marathon of one of my favorite TV shows, or I might listen to a custom cruise playlist I compiled just for this project. In less than a month, I’ll be sharing my pattern and fully cut kits with my Friendship Quilt Cruisers! 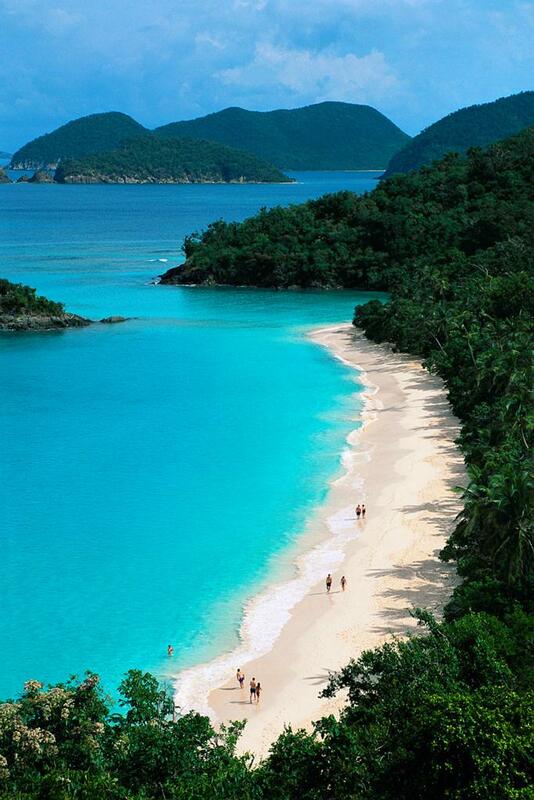 Join me in the Caribbean! Sounds good, right? I’d love it if you’d join us! We’ll leave Baltimore on Friday, March 28, 2014 on Royal Caribbean’s Grandeur of the Seas. Our ship was refurbished in 2012 and is just beautiful! Click here to read all about the ship. Our stops include Port Canaveral, Florida; Nassau, Bahamas; Coco Cay, Bahamas; and Key West, Florida. We can have beach time, shopping time, sightseeing time, and just lazy time. We’ll return to Baltimore on Saturday, April 5. 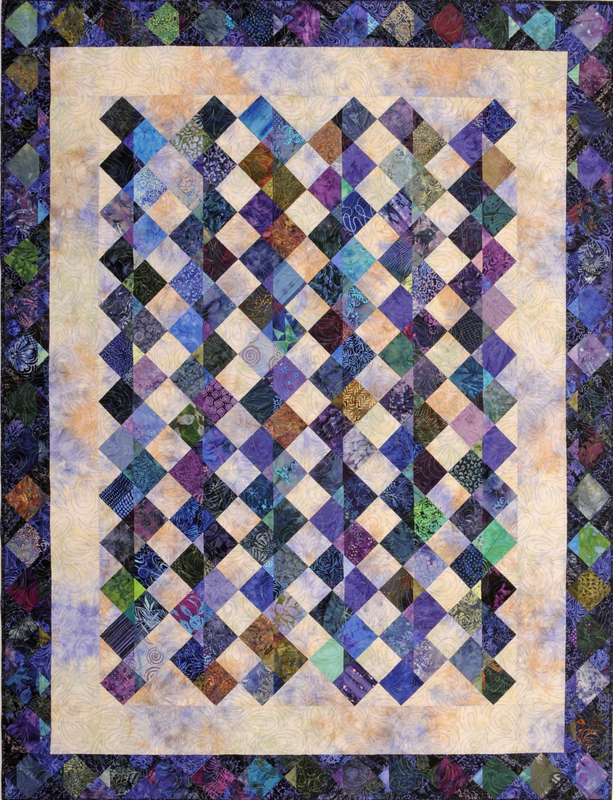 On three of our days, we’ll be at sea, having fun piecing a quilt. I’ll be teaching the techniques you’ll need to successfully complete our quick and easy project. This is my favorite pattern, Friendship Chain. Back before the Dawn of Time (when I was in elementary school), we used to make these zigzag bracelets out of paper chewing gum wrappers. This quilt reminds me of those bracelets, hence the name. I can almost smell the Juicy Fruit gum! 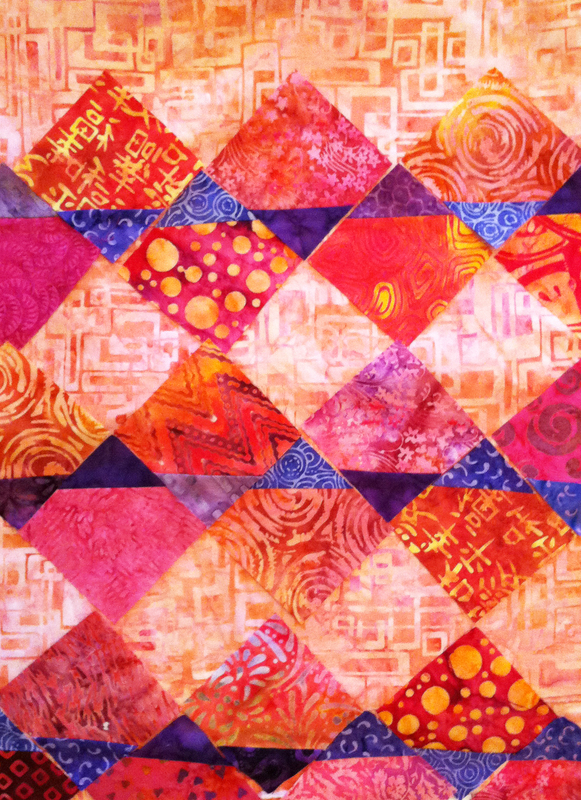 Quilt Cruisers will get to choose from two colorways: Purple Rain and Tangerine Sunrise. Our sewing machines are being provided for us along with an expert to troubleshoot as needed and keep us rolling in full bobbins! But the best part about our quick and easy project is that I will cut the kit for you. When you sit down to work, you will not have to cut strips or subcut blocks — it’ll all be ready for you to get started! If you are a fast worker (and you know who you are! ), you might want to bring a small UFO or two. While the ship has lots of distractions for your free time, you may finish your quilt top and want something to work on during the optional Stitch-and-Sail sewing times. Toward the end of our cruise, I’ll have a surprise project for you to work on. We’re going to have lots and lots of fun! 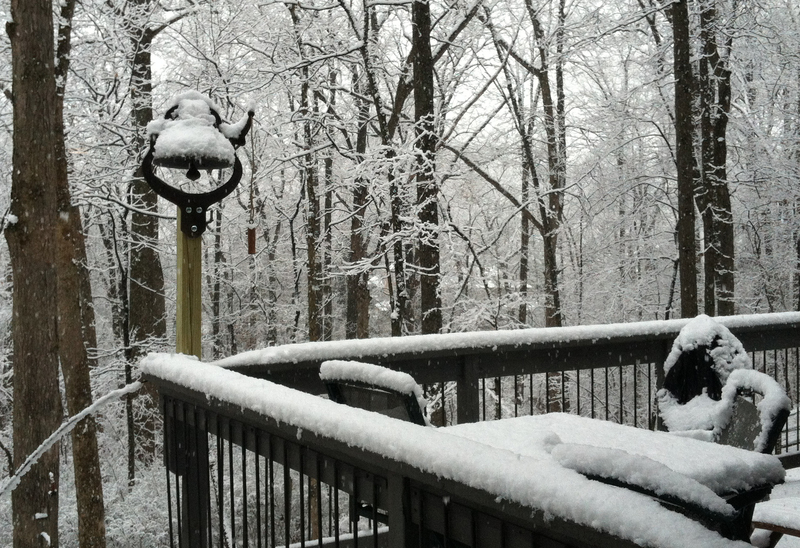 March 2013 in Virginia – Wouldn’t you rather be in the Caribbean in March 2014? I’d love you to join us! For more information or to register, contact Quilt Retreats at Sea. If you have any questions, e-mail me.